Bear Creek, West County, and Country Club Animal Clinics provide routine dental examinations, dental cleanings and tooth extractions for your animal. 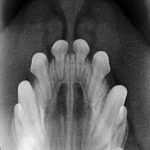 Does my pet need a "dental"? The necessity of dentistry in pets is determined by many factors such as age, breed, medical history and clinical signs. According to the Canadian Veterinary Medical Association, 80% of dogs and 70% of cats have oral disease by the age of 3. It is the most frequently diagnosed health problem in pets. Does My Pet Have To Have Anesthesia To Have Its Teeth Cleaned? The answer is YES. Because dogs and cats won’t hold their mouths open like people do while they are at the dentist makes anesthesia necessary. Anesthesia allows us to thoroughly examine every tooth (and we do examine every tooth! ), take x-rays if necessary, and to thoroughly scale away all signs of dental plaque and tarter and end with a polish which helps prevent plaque from accumulating on any rough surface. That being said, we strive to make anesthesia as safe as possible. The anesthetic agents used at our practice are tailored for your pets specific needs and are very safe. Additionally, all anesthetized patients have their own Registered Veterinary Technician and are under the direct supervision of one of our doctors from the beginning of their procedure and through recovery. Vital signs are continuously monitored throughout all of our anesthetic procedures with sophisticated monitoring equipment. Changes in respiration, blood pressure, oxygen levels or heartbeat elicit our immediate attention.